ElCap Report: An afternoon walk in Yosemite, Fall 2018. Yo… A little change of pace for this Report. Yesterday afternoon I took an hour or so “off” from shooting down at ElCap, and took a walk starting from Camp 4. It was so beautiful I have to share some shots with you. The first few are from around Camp 4, my home for the past weeks. As you can see they really pack campers into small spaces here… not so great for sleeping but we are just happy to be in Yosemite. The green tent, in the second shot, is my humble abode. I won’t describe the shots individually as anyone with a camera could have taken these shots just by walking around. The spacing of these is weird so just keep going down until you hit the next one. Yo… Man the solid weather has been here for so many days.. will it ever rain again?! Take advantage of this you Cubicle Pukes, rise up, leave the office, and come to Yosemite asap! I have had several days of many shots and have fallen behind on the Reports so I am posting them as I finish them…so this one is for Oct.18 and covers the time from the one before on Oct 15. Yo… Killer weather these days, including some cold nights! Lots of climbs going on now but the Nose has been virtually empty as has the Salathe. Lots of traffic has been seen over on the North America Wall. The season is in full swing now AND for the most part the NPS has taken Camp 4 back from the wild west show it had turned into. So now you will need that parking pass to use the lot and they are checking sites for poachers and unregistered tents. There is a $180 fine for failing to register! The leaves are rapidly turning their fall colors and the days are warm in the sunlit meadow but rather cool in the shade.. bring a jacket! Remember these reports are not complete coverage of all the teams climbing, as the daily ones were in the past… your team might not get a mention or a shot in the report. Get used to it, as I am not going back to the daily reports. Yo… Splendid weather continues after the three days of not so good conditions. The big routes are getting full attention now. Today there were 18 parties on the Nose route, although mostly spread out pretty well except for the first 4 pitches which were loaded past capacity. Other routes are available folks! Zodiac only has one party, the Trip is empty, Mescalito has just one party and the NA has one new party and another that is about to finish. So, pick a good route, that is not called the Nose or Salathe/Freerider! The shots below are from the last few days. Yo… Since the rains came a couple of days ago, I have been out and about taking some scenic shots. Much easier to write about than climbing! Speaking of climbing… Brett Evans, who is on the Trip, seems to have landed in the golden zone where it is dry and comfortable. He has continued to climb pitches each day and is doing just fine. No other teams, that I know of, are on the mountain. Now folks…. Some of you have been jumping other peoples fixed lines so you won’t have to climb some pitches. This practice is not ethical here in Yosemite. You should do your own climbing and fixing. At the very least you should find the people who fixed the lines and get permission to use those ropes. OK? Yo…The great weather continues to bless the fall season. The cliff is far from packed but it is drawing the wall climbers to it. The Nose is getting the lions share of the teams. The Face Lift is on now and that may be the reason for a thinned wall population. 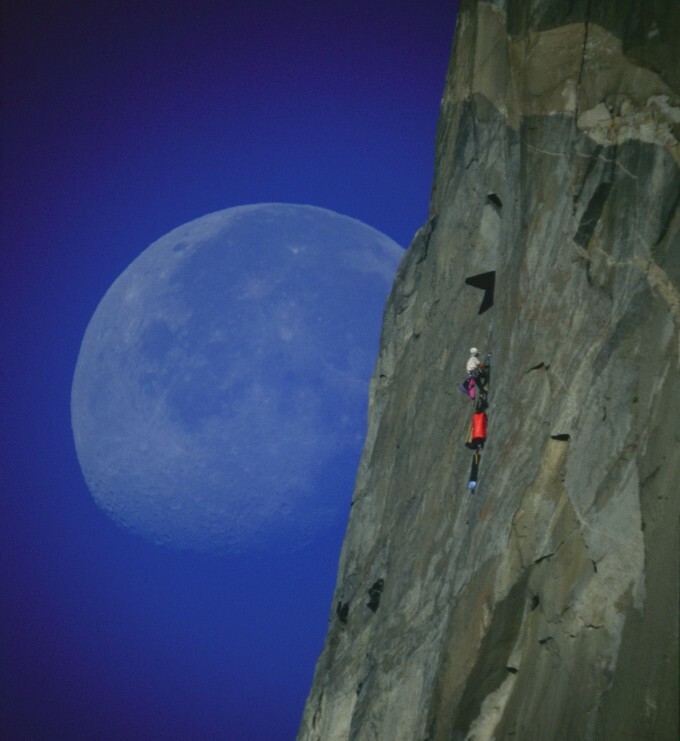 Tonight, the Face Lift is showing the Honnold film “Alone” and the turnout is expected to be epic. The real work of the event will start tomorrow as the volunteers head out to pick up trash and junk strewn about the park. Big events happen each evening this week… so if you are in the area be sure to come on by. Yo… Wake up Cubicle Pukes.. the ElCap Report is back! The 5 days I have been here have been perfect for climbing, not a cloud in the sky! As to be expected, the big trades are getting most of the attention. We do have some solo climbers up on the big lonesome, the solitude their objective. Oli is done with NNL while Matt is just starting. Stevie G is on a favorite … JTree was too hot so he came north. On the upper east side Zodiac and the Straw are getting some traffic but the rest of the SE face lies empty all the way to the Nose. Lots of action on Salathe and Freerider. The Nose is getting a lot of action but has yet to get jammed up. The Muir is becoming popular again with two teams on it at the moment, and another just off. I am in site 1 of camp 4, look for the lime green rain fly with the lights. I haven’t gotten around to do any scenic shots but hope to get away from EC in late afternoon. I will try to get a report out each week or so but understand that I will not be writing or posting shots of every team, although I will be shooting everyone.